Summary Details: The car hire excess insurance marketing website goes from strength to strength as it celebrates its second birthday. 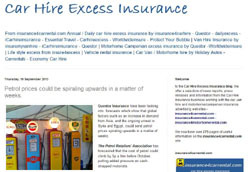 The site has grown since it's inception in 2009 advertising two car hire excess insurance companies to eight plus, two van hire and two campervan excess insurance providers. Back in February 2009, jml Property Services launched a specialist car hire insurance web site promoting the car hire excess insurance business of two well known companies. They had been marketing these products for a number of years on other insurance sites, but decided it was the right time to create a specialist web site for this niche market.. The site initially only had a few pages and over the next two years it has grown considerably to a site with over 100 pages of advertisements, guides and articles on car hire and insurance products that are associated with it. 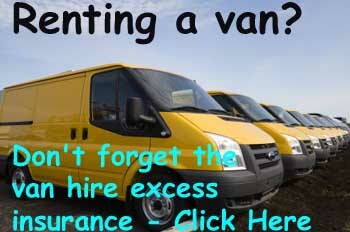 By September 2009 Van hire excess insurance had been added and then in August 2010 Campervan / motorhome hire insurance joined the product range. Back in 2002 when Towergate's insurance4carhire.com was set up by it's founder Larry Ursich they had the market to themselves. By 2010 there are some twenty five or more insurance companies offering car hire excess insurance products plus van hire and motorhome excess. There are also over six "compare" the car hire insurance product sites on the web and most likely by the end of 2011could be more. 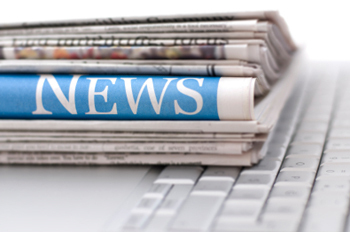 According to Philip Suter of jml Property Services, "competition has been good for this market, some providers have been offering great deals if the customer purchases the insurance from a company advertising on the www.insurance4carrental.com site. We currently have one company that has discounted its annual European product by just under £10 and it's Annual policy by £13 provided the product is purchased via dedicated link on our website"
Philip went on to say "Over the past two years we have generated some excellent business for the insurance companies advertising on the site and as there are still plenty of people hiring cars this will continue for the foreseeable future". insurance4carrental also has a blog site and Twitter page.